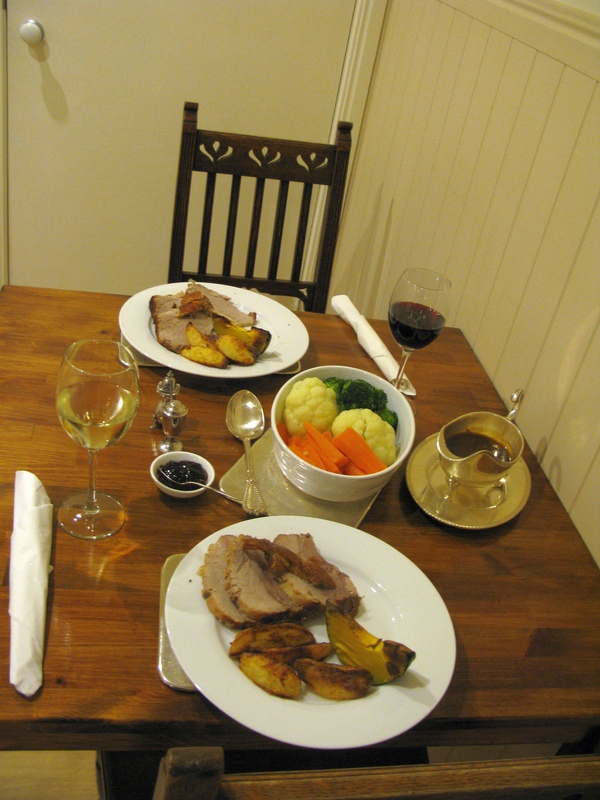 Home cooked dinner – roast pork and veges – soooo good! 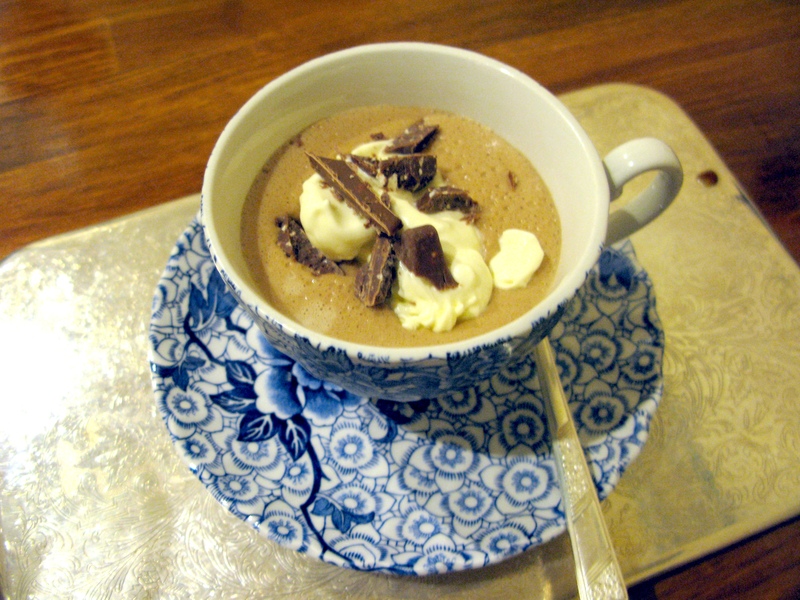 The dessert: Toblerone Mousse (homemade as well) – AMAZING! I’ll try not to be so slack with posts, the last few weeks have been quite stressful and busy with IVF stuff and other things, so haven’t had much of a chance to think about the blog, but that will change, I promise! 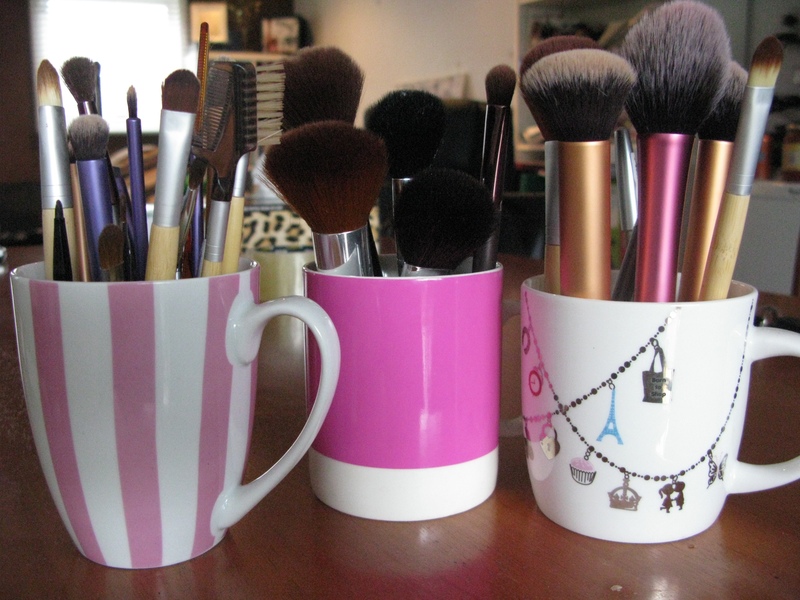 This is currently how I store my makeup brushes – in cute little mugs! I fill the mugs with vase gravel from the discount store and then buy mugs that I like when I go shopping at affordable department stores like Big W, K-Mart and Target. The left and the right mug are from Big W but the middle one is a more expensive mug from a design store, one of those pantone coloured mugs. 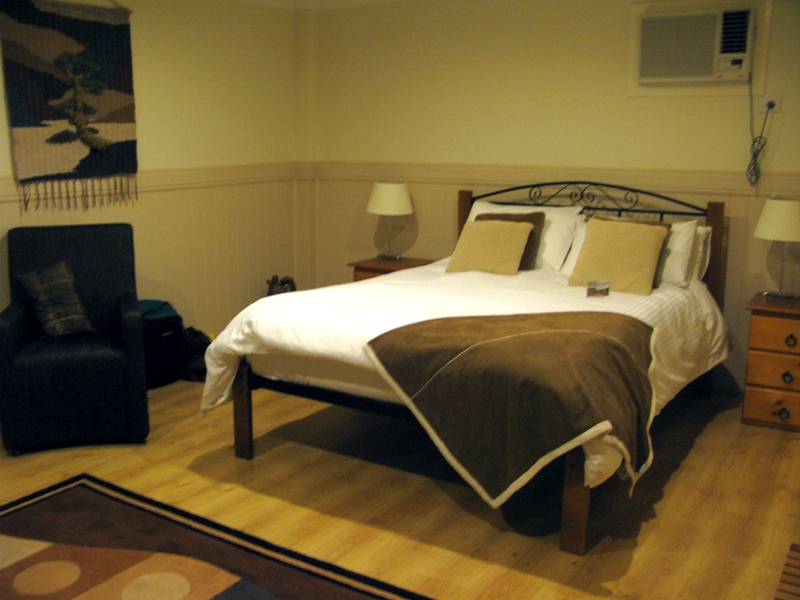 The pantone colour number isn’t facing the camera though, sorry! I was disappointed in the quality of the pantone colour mug because it’s not dishwasher safe, so I decided to use it to store my brushes instead of using it for drinking. The other two were cute and inexpensive and I liked the idea of storing my brushes in something decorative. The downside to using mugs is that the handles use up a lot of space compared to a more streamlined, square or rectangular shaped brush holder. Since I don’t have many brushes though (in comparison to some other makeup junkies anyway), the space inefficiency doesn’t matter so much. I think I need to get another mug though just to separate my dirty brushes from the clean ones (and also I just like mugs hehe). As much as I’m a palette junkie, eyeshadows don’t look amazing without definition, so I’ll keep my mascara, eyeliners, lipsticks and lip glosses, thanks! Coral seems to suit my skin tone better. 7. Would you rather only use one eye shadow color or one lip color for the rest of your life? Summer clothes in the winter – I can layer them at least. A mix, to be completely honest, but probably leaning towards more bright colours. I’d give up my favourite eye product, my lip products tend to be more practical for me anyway. 12. Would your rather never be able to paint your nails again or never use lip gloss? Never use lip gloss! I would be rather frustrated if I couldn’t paint my nails again. What a cruel question, ughhhhh – I’d shave my eyebrows with the hope they’d grow back fast…. Have a go at this tag! I tag you and you and you and you (and you)! 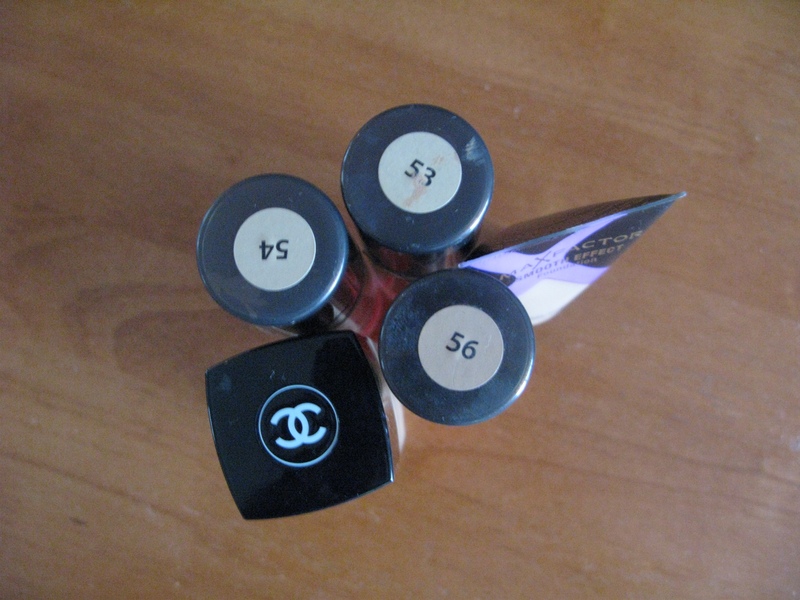 L to R: Chanel Mat Lumiere foundation in 40 Beige (should have gotten 50 naturel but the counter didn’t have it and I thought it would be ok – wrong, too pink, boo! 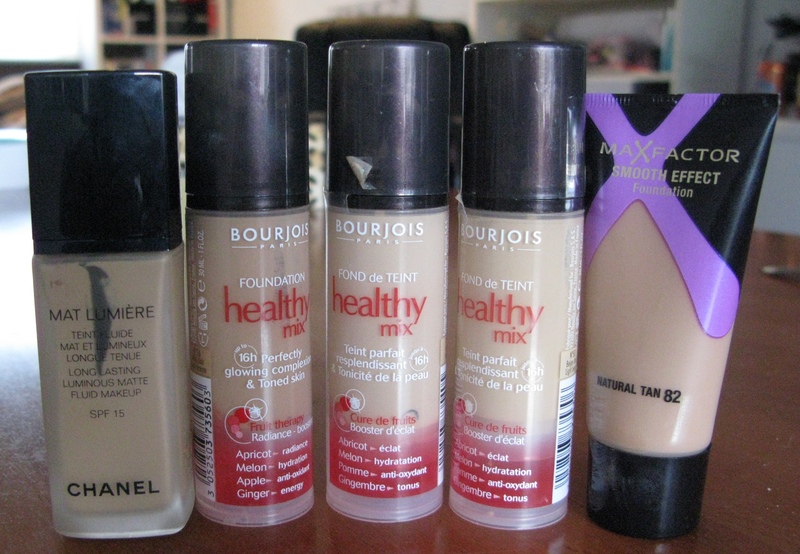 ), Bourjois Healthy Mix in 56, 54 and 53 (too light and too pink!) 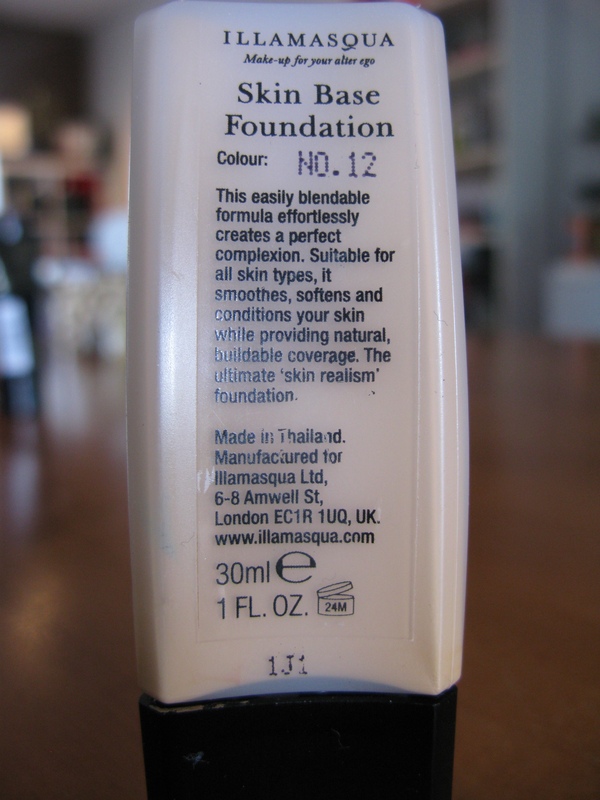 and Max Factor Smooth Effect in Natural Tan 82 (too pink again). I would really love to try Chanel’s Mat Lumiere in 50 naturel but the Chanel Counters here only stock it to shade 40, which is kind of racist 😛 I really love the Mat Lumiere foundation otherwise – it applies really smoothly, evenly and gives good coverage settling to a matte but not cakey finish. Nearly perfect, but the shade range blows. Now onto my HG foundation! 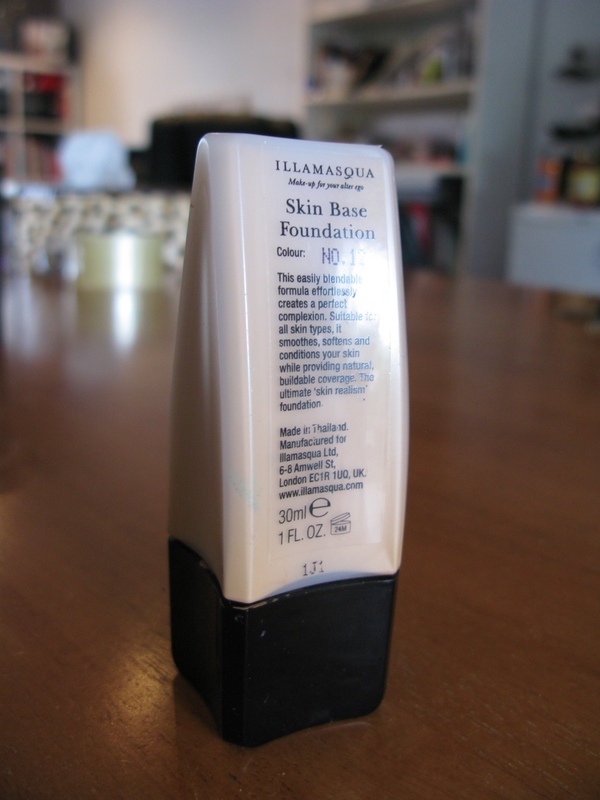 I wanted to get a picture of the front of the packaging but my camera kept focusing *behind* the product – i have a feeling it’s because the front of the packaging simply says, “Illamasqua” and it’s all skin coloured, so it doesn’t think there’s anything to focus on. Frustrating! Anyway, google is your friend if you want to see what the front of the packaging looks like. 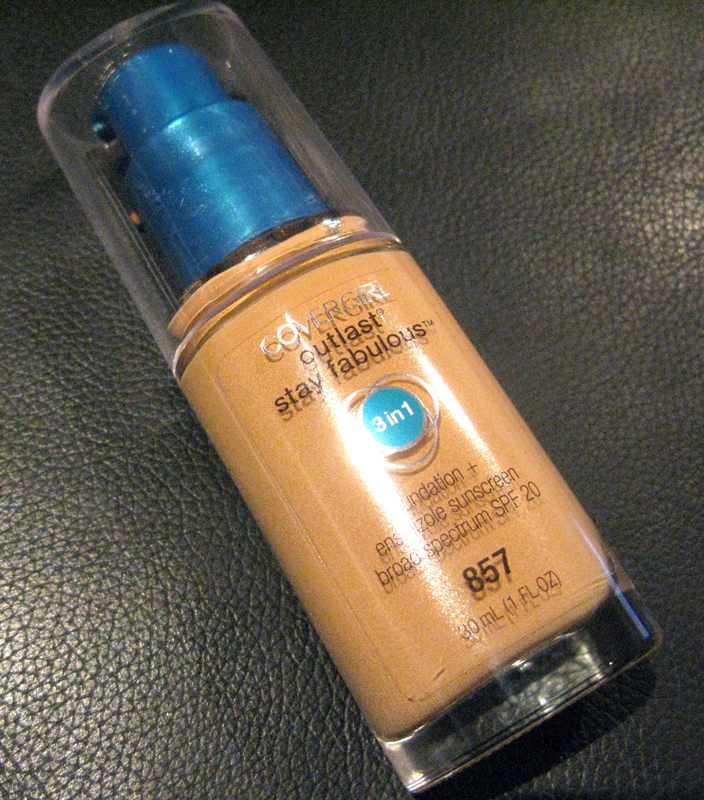 Why is this my holy grail foundation? For starters, the shade is perfect for me. It’s very yellow based but not too much for me and it can be applied sheer or built up to full coverage without looking cakey. A little goes a long way, which is great because you don’t get much product overall, but you don’t need it. If I want a medium coverage look, I will only need a small squirt of the foundation then I’ll dab the product in small dots all over my face before using a buffing brush to apply and blend in circular motions. This will cover most of my blemishes and imperfections and definitely evens out any redness or uneven skin tone. Then I go in with my NARS radiant creamy concealer under my eyes and on my blemishes that haven’t been fully covered with my foundation and voila, flawless face! I’ve read some comments online and watched YouTube videos saying that this foundation works better for dry skin, and while it does get a bit oily and wears off after around the 4-5 hour mark on me (I have oily/combo skin) I think oily/combo ladies and gents can still use this because it doesn’t clog pores or make skin look like an oil slick – I think the problem is that it just slips off your skin faster if you have oily/combo skin than if you have dry/normal skin. You may just need to touch up with blotting paper or powder earlier than you’d like, but I still like the coverage overall. The lasting power could be improved, but otherwise it’s a really nice foundation and I have yet to find one I like as much. Since this is such a recent purchase, I don’t have too much to say about it yet. My first impressions are that the shade is so close to being right but leans too pink for me (only slightly) and that you do need to pump out a lot of product to get a full coverage face if you’re like me and have a fair few blemishes/scars/pigmentation to cover up. 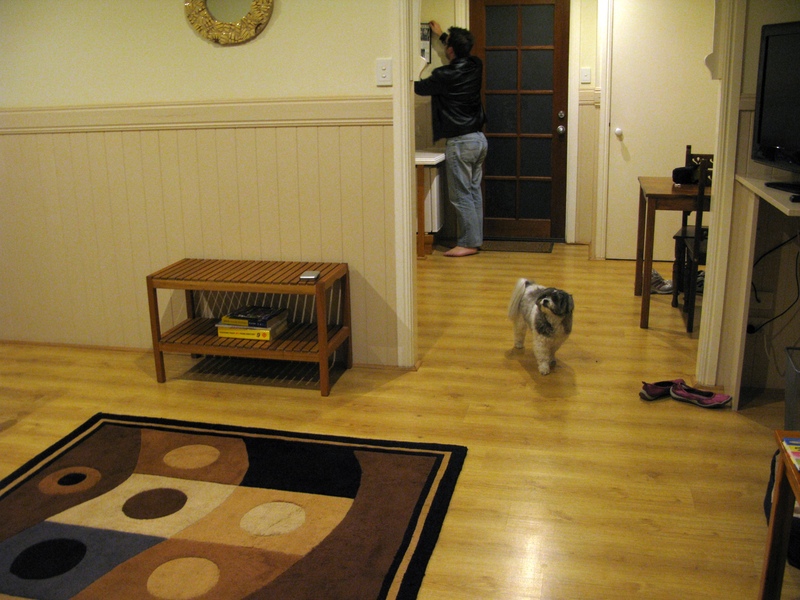 It applies smoothly and evenly but I’m not happy about the coverage…we’ll see how I go after a bit more time using it. I like the packaging as the pump is lockable which is great for travel and it’s a pretty sturdy glass bottle though the lid is flimsy but the lockable pump reassures me that the product shouldn’t explode everywhere when travelling. So far so good but I’ll let you know my indepth opinion in a little while!